It’s very rare for a state to legalize medical marijuana and stick to timelines surrounding rule-making and implementation, especially when it comes to dispensaries. Illinois is a great example. Illinois took way longer than expected to even license medical marijuana growers and dispensaries, and patients are still waiting for their medicine. 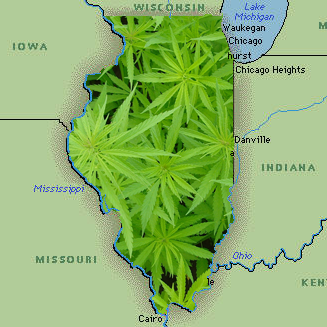 Cases like Illinois are why I always point out the need for home cultivation provisions. Without a home cultivation provision, patients in states that drag their feet have no choice but to either go without medicine, or purchase it from an unregulated blackmarket. Many states have taken years to implement MMJ laws, develop regulations and get the first businesses up and running. Minnesota, on the other hand, passed a law just last spring legalizing non-smokeable medical cannabis, and dispensaries are now on track to open to the public on July 1. “We are aiming to open three of our four dispensaries in July, and hopefully the fourth one will be in August,” said Dr. Kyle Kingsley, CEO of Minnesota Medical Solutions (also known as MinnMed). Leafline Labs, the other MMJ producing and dispensing company licensed by the state, is also on track for the summer, said co-founder Dr. Andrew Bachman. “We’re ahead of schedule in construction (and) production and will certainly have medicine available to be dispensed on July 1,” Bachman said. Federal agents will no longer be able to raid medical marijuana dispensaries in states where medical marijuana is legal under a provision included in the $1.1 trillion spending law President Obama signed December 16. Enactment of the law changes a two-decade-long battle between the states and the federal government. Although 32 states and the District of Columbia have legalized medical marijuana, the Drug Enforcement Administration still classifies it as a Schedule I drug, the same class as heroin, LSD, and ecstasy, which signifies it has no accepted medical use and a high potential for abuse. 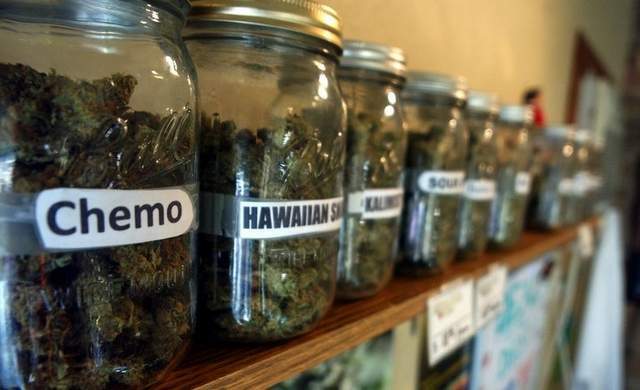 Before this law, the Justice Department could shut down dispensaries that states legally opened, although under the Obama Administration the department had kept its distance. 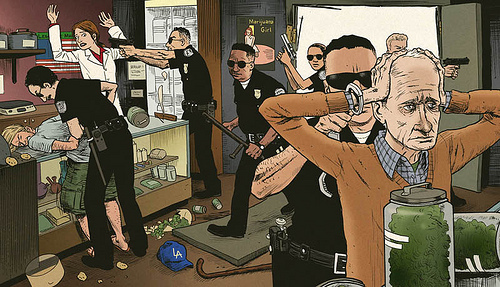 Under the measure, included in the 1603-page law, federal agents would be prohibited from such raids. The government also cannot interfere in implementation of states' medical marijuana laws, under the amendment cosponsored by Republican Rep. Dana Rohrabacher and Democrat Rep. Sam Farr, both of California. "This is a victory for so many," Rohrabacher said in a statement, "including scores of our wounded veterans, who have found marijuana to be an important medicine for some of the ailments they suffer, such as PTSD, epilepsy, and [multiple sclerosis]." The move is also a victory for medical marijuana advocates and dispensary owners and operators. Pharmacist Joseph Friedman, RPh, in Lincolnshire, Illinois, has applied to open three dispensaries in Illinois. He told Medscape Medical News the move brings "a sigh of relief" and adds a layer of protection for owners and operators of dispensaries. "Every day these dispensary owners open their doors, they had in the shadow the risk of the feds coming in and shutting them down for any number of reasons," he said. "That's not to say that the ones selling to children or that are close to schools or doing anything under the table don't deserve to get shut down. "We had only heard up until this point that the federal government wouldn't fund any more raids on dispensaries, so this just makes it official," he said. From new marijuana strains for the holidays to gift sets and pot-and-pumpkin pies, the burgeoning marijuana industry in Colorado is scrambling to get a piece of the holiday shopping dollar. Dispensaries in many states have been offering holiday specials for medical customers for years - but this first season of open-to-all-adults marijuana sales in some states means pot shops are using more of the tricks used by traditional retailers to attract holiday shoppers. Sweets and marijuana seem to go together like hot chocolate and marshmallows. Many dispensaries this time of year resemble a Starbucks at the mall, with holiday spices and festive music in the air. One of the state's largest edible-pot makers, Sweet Grass Kitchen, debuted a new miniature pumpkin pie that delivers about as much punch as a medium-sized joint. The pie joins holiday-spiced teas, minty pot confections and cannabis-infused honey oil for those who want to bake their own pot goodies at home. Even some edibles makers that specialize in savory foods, not sweets, are putting out some sugary items for the holidays. "It just tastes too good, we had to do it," Better Baked owner Deloise Vaden said of her company's holiday line of cannabis-infused sweet-potato and pumpkin pies. Some shops are angling for high-end holiday shoppers, not an increase in foot traffic. Colorado Harvest and Evergreen Apothecary timed the release of some top-shelf strains of potent pot for the holiday season. Spokeswoman Ann Dickerson says they're "sort of like the best bourbon or Scotch that will be competing on quality, rather than price." The Massachusetts Department of Public Health has given three companies provisional approval to open four medical marijuana dispensaries in the state. Patriot Care Corp., which already has a Lowell dispensary in the works, was approved for dispensaries at 21 Milk Street in Boston and 7 Legion Avenue in Greenfield. Coastal Compassion, Inc.’s proposed facility at 2 Pequod Road in Fairhaven and Mass Medicum Corp.’s on Revolutionary Drive in Taunton were also approved to enter the inspection and permitting phase. The four dispensaries are proposed in counties that did not previously have any provisionally approved medical marijuana dispensaries. It’s great that there are now fifteen medical marijuana dispensaries in Massachusetts at one stage of the process or another. However, the fact that there are still zero open is unacceptable. Patients need safe access to affordable, quality medical marijuana. Hopefully these establishments open sooner rather than later. How great is the demand for medical marijuana dispensary licenses in Illinois? So much they may rival the iPhone 6 in popularity right now. That’s about the best way to guess how many applications were filed, as officials couldn’t even give an estimate on the number of applications filed. The Medical Cannabis Pilot Program will issue only 60 licenses, so these may actually be more in demand than the iPhone, and more valuable. Mark Huddle, an attorney for Illinois Grown Medicine, brought 25 boxes of paperwork to the Thompson Center as part of the application process for five dispensaries in northern Illinois. Huddle told the Sun-Times “everyone from Cheech & Chong types to hedge fund guys” applied for dispensary licenses. Want to lay odds on who gets the licenses? It’s a painstaking process to land one of the highly coveted dispensary licenses, part of what Gov. Pat Quinn calls one of the toughest decriminalization laws in the country. Chicago, using its power of home rule, tried to relegate dispensaries and cultivation centers within the city limits to planned manufacturing districts requiring special-use permits from the Zoning Board of Appeals, and establishing minimum spaces based on facility size. But new zoning regulations approved in July by the City Council Zoning, Landmarks and Building Standards could potentially allow for medical marijuana dispensaries to be located near the city’s high-traffic tourist areas and tony nightlife districts. The regulations were passed after the state refined language in the medical marijuana law regarding where dispensaries would be located. 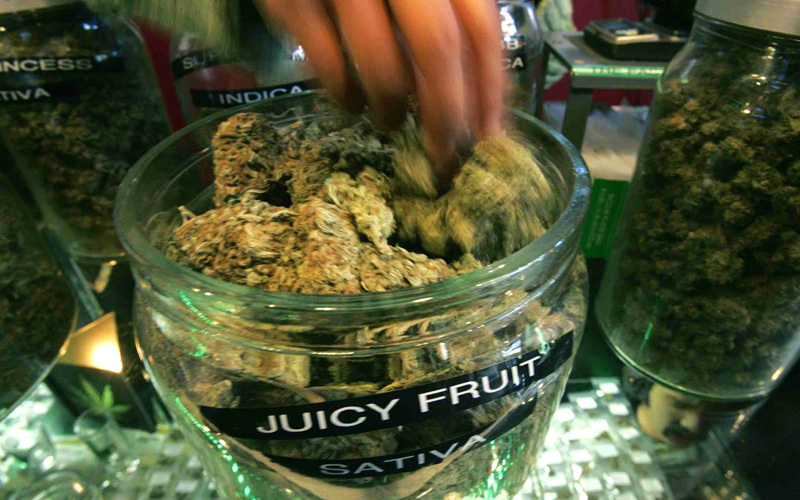 Roughly 47 groups have thrown their hats in the ring for dispensary permits. Given that Las Vegas will ultimately allow just 12 dispensaries, at least 35 applicants will be rejected. The city received a total of 63 applications by last week’s deadline for medical marijuana business licenses. There’s a lot at stake for the medical cannabis industry in Las Vegas. Whenever there are so many more applications for medical cannabis businesses than there are licenses available, I get leery. The criteria for a business to get a license likely won’t be who is going to do the best job, it will be either who is willing to pay the most money, or who wins a lottery. When that happens, people that would be best at operating the business and have the most applicable knowledge may not get picked, and could get passed up for someone that is simply lucky, or has deep pockets without any past experience in the cannabis industry. 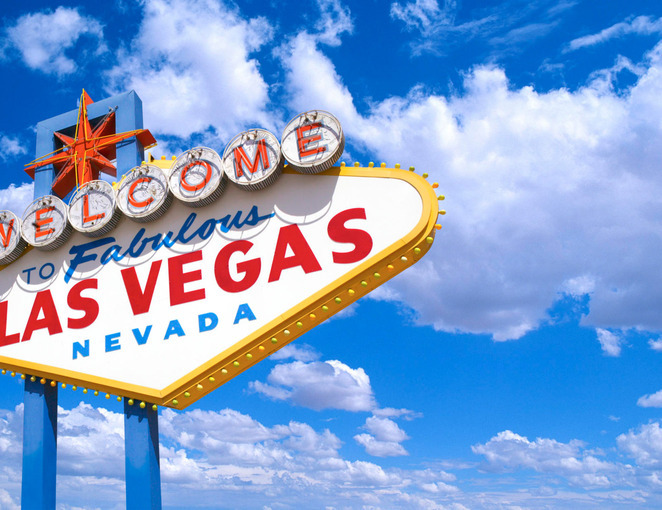 With Las Vegas dispensaries recognizing the medical cards of other states, business will likely be booming for yet another industry in the vacation destination.